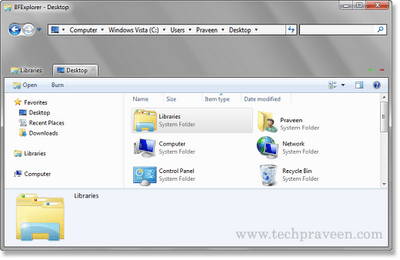 Looking for a good alternative to windows explorer? Then you are at right place.BExplorer provides tabbed windows file browsing.BExpolrer is still under Alpha stage.The Better Explorer got Tabbed browsing and additional toolbars which makes Windows 7 much more user friendly and stylish Os. Better Explorer is designed for Windows 7 but still it works fine with Windows Vista.